Tips on how to get the Ultima Weapon keyblade in Kingdom Hearts 3. In Kingdom Hearts 3, there are a variety of keyblades you can unlock, including the Ultima Weapon. Unlike keyblades like the Happy Gear that unlock after completing a world like Monstropolis, the Ultima Weapon is “secret” in that you’ll need to complete a few different requirements in order to unlock it. Then, once it’s unlocked, you’ll need to craft it in order to use it in Kingdom Hearts 3. Confused? We’ve got you covered! Below, we’ve put together a quick guide on how to get the Ultima Weapon keyblade in Kingdom Hearts 3. You'll need to collect all 58 Synthesize materials, then gather the crafting materials needed to unlock the Ultima Weapon keyblade in Kingdom Hearts 3. The Ultima Weapon is one of the last keyblades you’ll unlock in Kingdom Hearts 3. The reason for this is that its main requirement is that you collect all 58 Synthesize materials. If you’re unfamiliar with what these materials are, you’ll want to pay a visit to one of the Moogle Shops. In each Moogle Shop, there’s a Workshop section. Select Workshop, then you can choose to either Synthesize Items, visit the Keyblade Forge to upgrade your keyblades, review Photo Missions and Collector’s Goals, or view a Material List. Once you familiarize yourself with the names of various Synthesize materials, you’ll need to head out and explore Kingdom Hearts 3 to earn these materials. Completing the game’s main story mission helps, though you can also run through Battlegates and revisit previous worlds like Olympus. After earning all 58 Synthesize materials, visit the nearest Moogle Shop and select the Workshop again. At this point, you’ll receive a confirmation that you’ve obtained all 58 Synthesize materials. 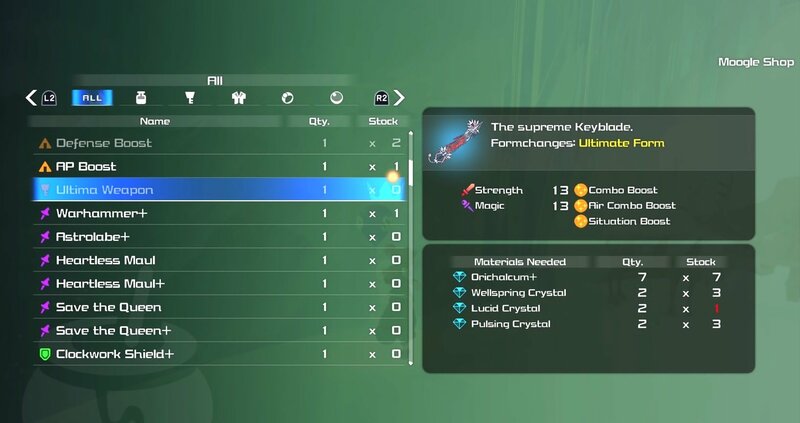 To craft the Ultima Weapon keyblade, you'll need to gather materials including 7 Orichalcum+ in Kingdom Hearts 3. With that step done, select Synthesize Items and in the menu, you should see a new entry for the Ultima Weapon. With the Ultima Weapon entry available, you’ll need to gather all of the required materials in order to craft it. The materials needed to craft the Ultima Weapon are listed below. With those materials available, you can enter the Synthesize Items menu and select the Ultima Weapon listing to craft it. In doing so, you’ll be able to use the keyblade in battle, and you’ll unlock two achievements: Ultima Weapon and Blademaster. 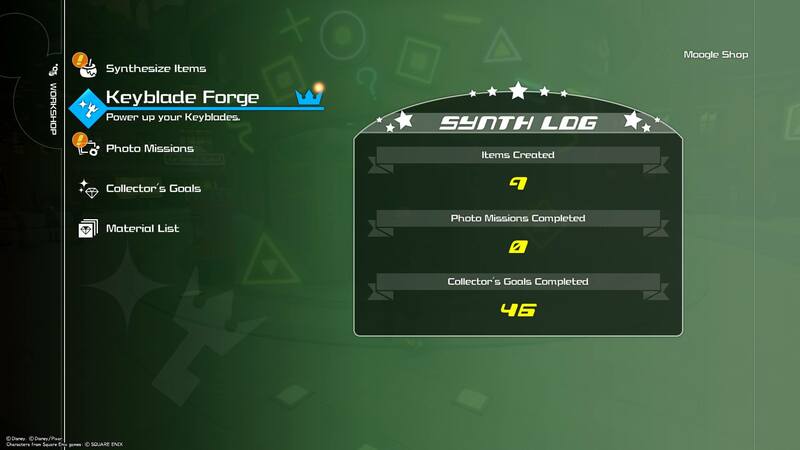 Note that the second achievement unlocks once you’ve collected all keyblades in Kingdom Hearts 3. Of course, the Ultima Weapon should be the final keyblade due to the rarity of its crafting materials, particularly the Orichalcum+. Speaking of which, having a hard time finding Orichalcum+ in Kingdom Hearts 3? We’ve listed a few good places to look for the rare material down below. Lucky Emblems: You earn Orichalcum+ after you find and photograph 80 Lucky Emblems. Postcards: Mail off Postcards for a chance to win Orichalcum+ as a random reward. Eclipse Galaxe Boss: While exploring in your Gummi Ship, look for the large boss inside the Eclipse Galaxy. By defeating this enemy, you’ll earn Orichalcum+ as a reward. Snow Sliding: Return to Arendelle and try your hand at the Snow Sliding Mini Game. If you’re able to collect all of the treasures, you’ll earn Orichalcum+ as a reward. The Caribbean: Orichalcum+ can be found inside a Treasure Chest on Exile Island in the Caribbean. Keyblade Graveyard: Return to the Keyblade Graveyard at the Badlands save point, then enter the red orb behind the #13 Battlegate. 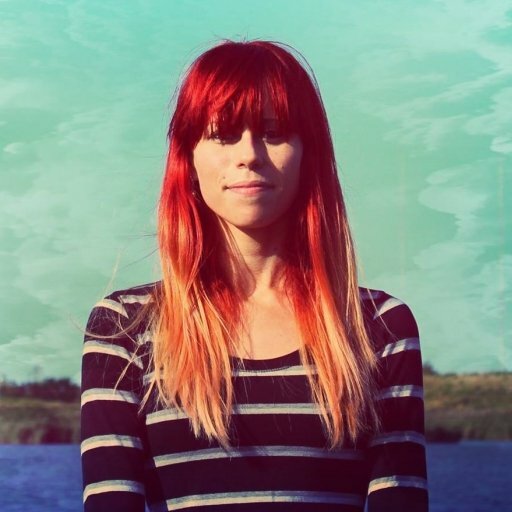 This will take you back to the Final World. In the Final World, you'll find a Treasure Chest with Orichalum+ inside. Flantastic Seven: Earn a high score in all 7 mini-games offered by the Flantastic 7 to receive Orichalcum+ as a reward. Those are just a few ways in which you can earn Orichalcum+ in Kingdom Hearts 3. Again, with all 58 Synthesize materials collected, you’ll unlock the Ultima Weapon entry. Then, with the required materials on hand, you can craft the Ultima Weapon keyblade and use it in Kingdom Hearts 3. For more on this process, be sure to check out the Ultima Weapon gameplay video below courtesy of YouTube user CGInfernoBlast. Were you able to unlock the Ultima Weapon keyblade? If so, what do you think of its stats? Let us know down in the comments below! For more on Kingdom Hearts 3, be sure to check out some of our previous guides including the list of all keyblades in Kingdom Hearts 3, the complete world unlock order in Kingdom Hearts 3, and where to mail Postcards in Kingdom Hearts 3.